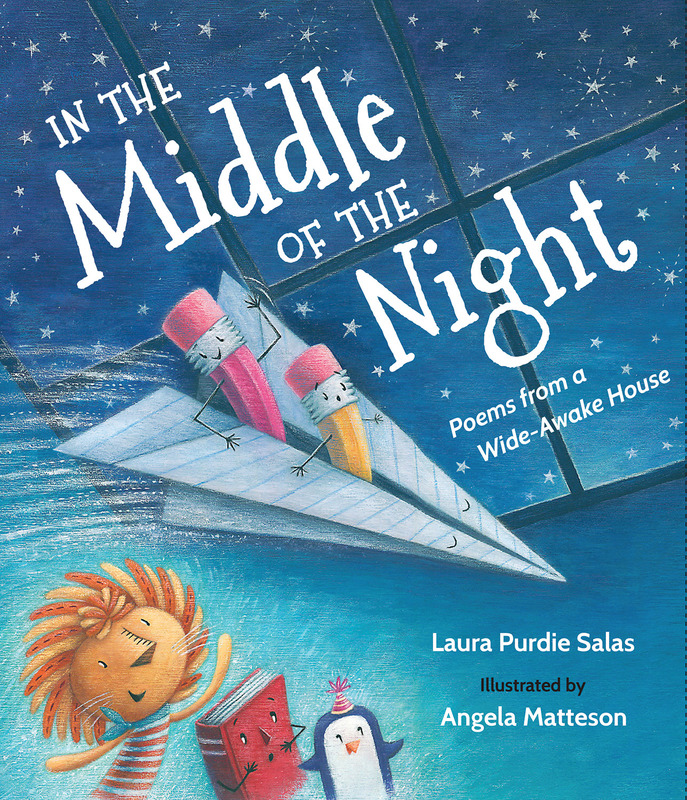 So many congratulations to Laura Purdie Salas, who has not one, but three new poetry books so far this year! 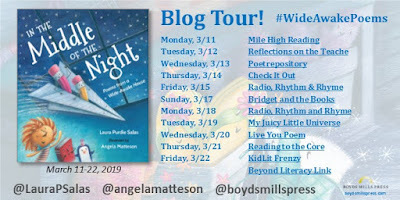 I'm thrilled to be part of her blog tour for IN THE MIDDLE OF THE NIGHT: POEMS FROM A WIDE-AWAKE HOUSE, illustrations by Angela Matteson, brought to us by the wonderful folks at Wordsong/Boyds Mills Press. What a fun concept, right? 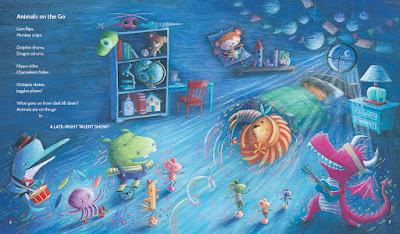 Reminds me of TOY STORY and NIGHT AT THE MUSEUM... who hasn't wondered what the household items are doing while we sleep?? Please find Laura's answers to 4 simple prompts below. Thanks, Irene, for hosting the blog tour today! I can’t tell you how lovely it is to be appearing at Live Your Poem! The beauty of it was that revision shouldn’t happen from the same head space, and that maybe that passage of 2 years actually helped my revision. And Rebecca’s letter and thoughts were great springboards for some deep thinking. But…I still remember that feeling of panic! The delicious: Angela Matteson’s art, without question. As an author, you just never know what to expect, even when you like an artist’s style! Angela blew me away. Her deep, gorgeous colors and wonderful facial expressions kept this book lively and enchanting—erasing my initial worries that it might end up too dark and gloomy. And, going back to that revision I mentioned above, it was delightful that a reviewer specifically called out how strong the two poems in the parents’ room were. Writing poems about the parents’ belongings was completely Rebecca’s idea. So, I guess the delicious part is that I couldn’t have asked for a more wonderful collaboration! The unexpected: I even got students in on the revision process. In 2016, I was teaching poetry at a Young Authors Conference. That same week, I was doing some final edits on In the Middle of the Night—tweaking and polishing this time around. As the students filed in and found seats, I had different versions of a poem projected for them to read, and then the students voted on which worked best. It was only the difference of a word or two in each case, but students—by sharing their votes and opinions—helped me polish several poems that week! Thank you, Laura, for bringing so much fun to nighttime. Thank you, Irene! I enjoyed your freeform prompts! 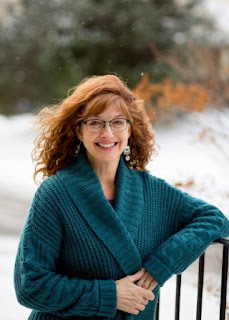 I know about this new one from Laura, but it's lovely to read more from her about it and how the revision went, how it was helped along by others, too. I know it's going to be one that kids will love. Thanks, Irene, and Laura! 2 years is a long time to let those poems marinate...it probably WAS good it took that long! Congrats again, Laura! It was totally terrifying, though. Thanks, Matt! It is a beautiful book. The poems and illustrations work together perfectly! I can't wait to share it with my grandchildren. Congrats, Laura! Lovely blog piece, Irene!